Let's visit the Ghostbusters locations in the order of their appearance. Ghostbusters is a documentary film released in 1984, depicting the work of New-York-based parapsychologists Dr. Peter Venkman, Dr. Raymond Stantz, and Dr. Egon Spengler. It shows the events leading up to the cross-dimensional rift that briefly unleashed Gozer the Gozerian, the largest such rift since the Tunguska Event of 30 June 1908. 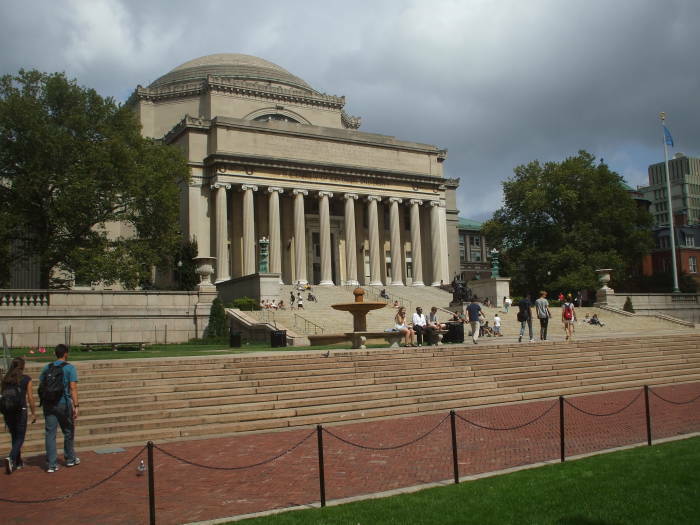 The movie opens at Columbia University, where the Ghostbusters were faculty members. Here you see the north side of the main quadrangle on campus. The Department of Psychology and Parapsychology is just out of the picture to the right. 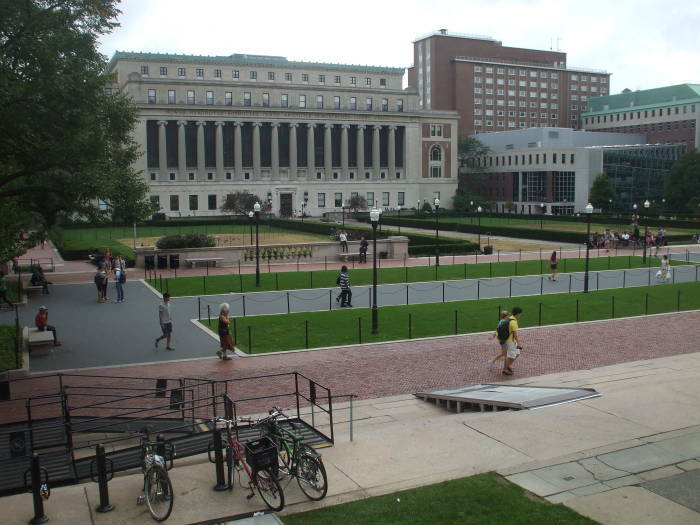 In the second picture we are looking the other direction across the south side of the main quadrangle at Columbia University. You can get to Columbia on the #1 subway to 116th Street. Or, for better views, take the M4 or M104 bus along Broadway. Only psychology is mentioned on the campus maps, presumably because those maps are somewhat out of date. 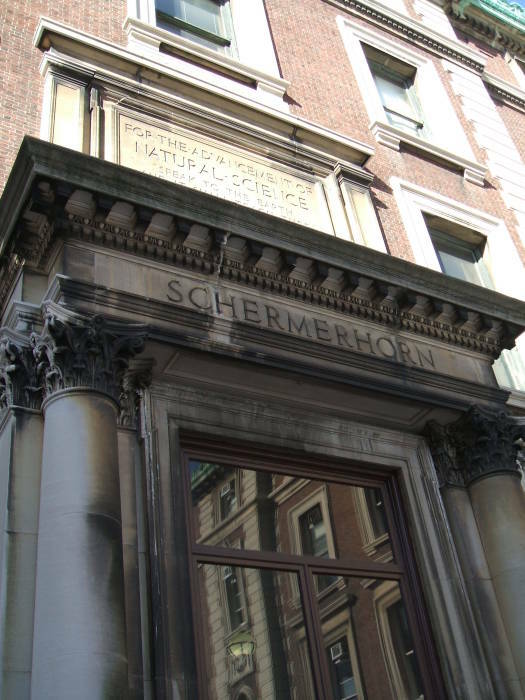 The offices of Doctors Peter Venkman, Raymond Stantz, and Egon Spengler are here in Schermerhorn Hall in the School of Psychology and Parapsychology. 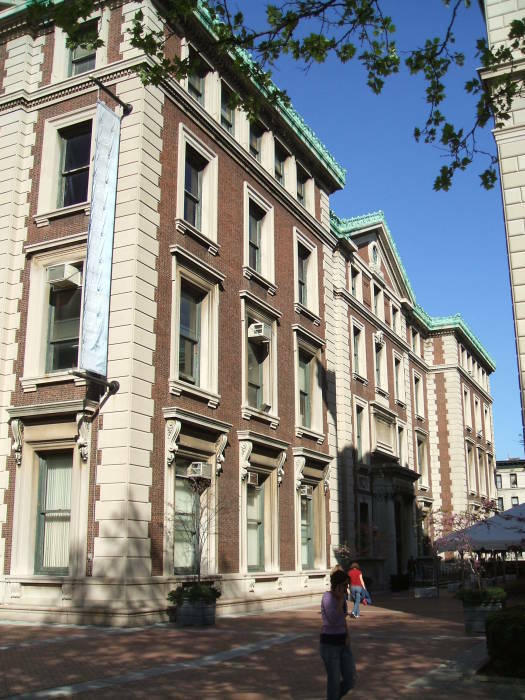 You will notice, of course, that the movie used a different building for the filming location, the Chemistry Department's Havemeyer Hall, and referred to it as "Weaver Hall". 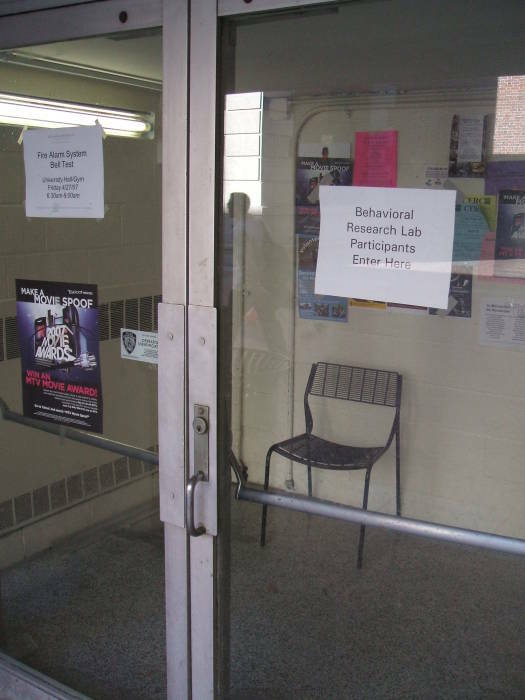 "Behavioral Research Lab Participants Enter Here"
Watch out for those electrical shocks! The Bloomingdale Insane Asylum was a private hospital for the mentally ill founded by New York Hospital 1818. 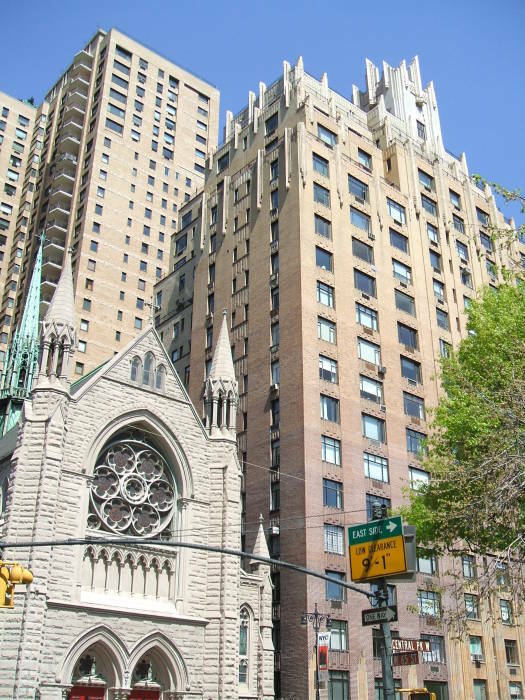 It was located in the Morningside Heights area, at the time well outside the city. The 26-acre plot was expanded through the 1880s with more buildings built. Columbia College (later to become Columbia University) purchased the bulk of the property and began constructing its new campus. The only building surviving from the Bloomingdale Insane Asylum is Buell Hall, located close to Schermerhorn Hall and the School of Psychology and Parapsychology. 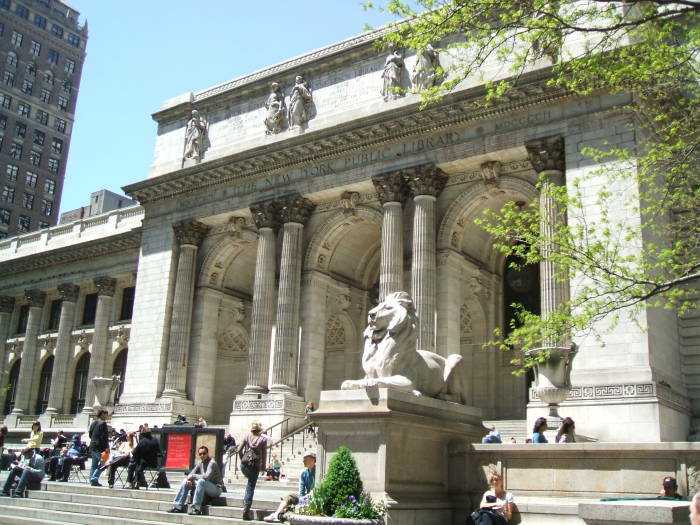 The main building of the New York Public Library was the site of the symmetrical book stacking incident, just like what was seen in the Philadelphia mass turbulence of 1947. The library is on 5th Avenue between 42nd and 41st Streets. Most any subway line and many of the buses can get you to within a few blocks of here. To get here from Columbia, if you are following these in the order of appearance in the movie, the quickest way would be to take the #1 subway to Times Square and walk one block east on 42nd Street. A more scenic route would be the #104 bus, which will take you down Broadway to Columbus Circle, across Central Park South to 7th Avenue, down that to 42nd Street, and across 42nd past the library and continuing past Grand Central Station. 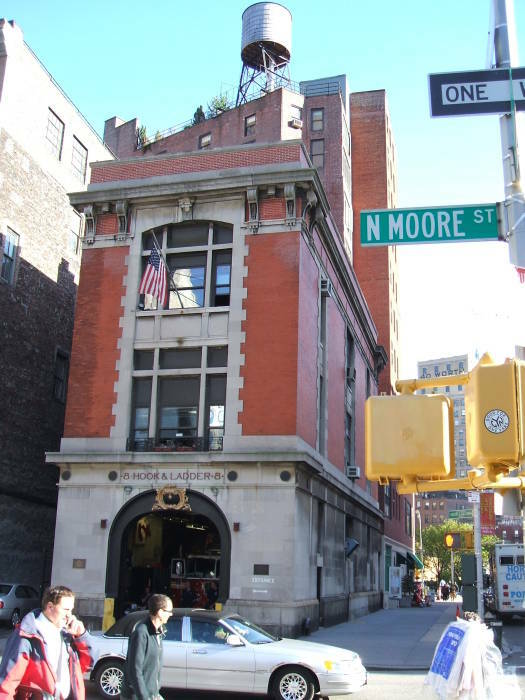 Ghostbusters headquarters is at 10 North Moore Street. 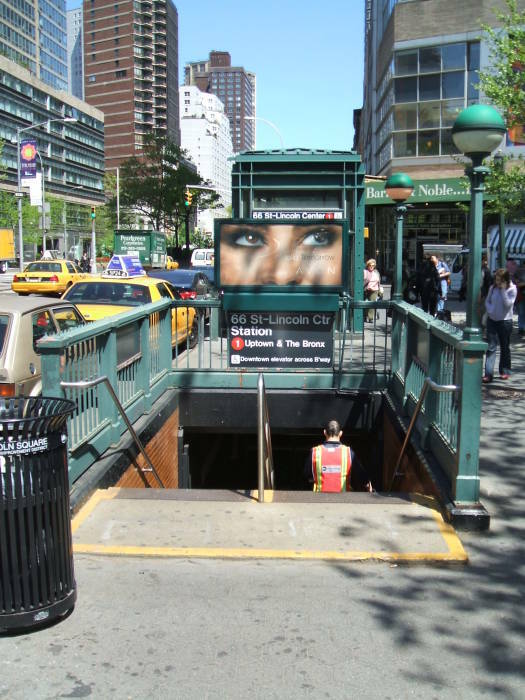 Take the #1 subway to the Franklin Street station. Exit by the stair at the rear of the southbound platform, and you're right across the street where this picture was taken. Or, the #20 bus runs right past here, and the #6 runs just one block to the east. 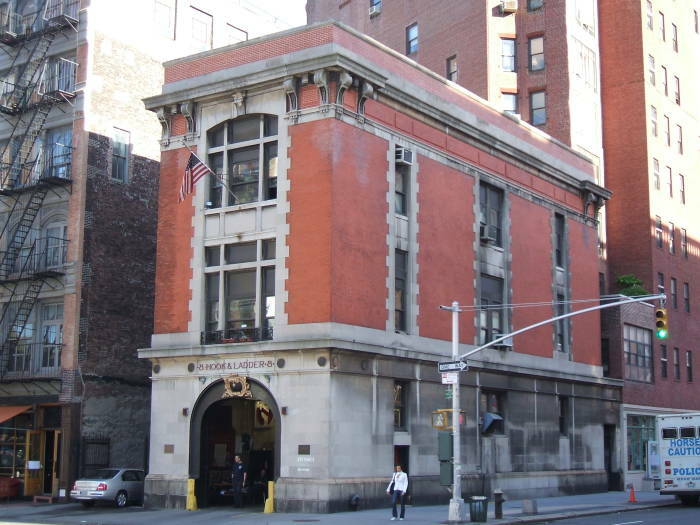 Ghostbusters headquarters has been re-converted back into an active NYFD station. 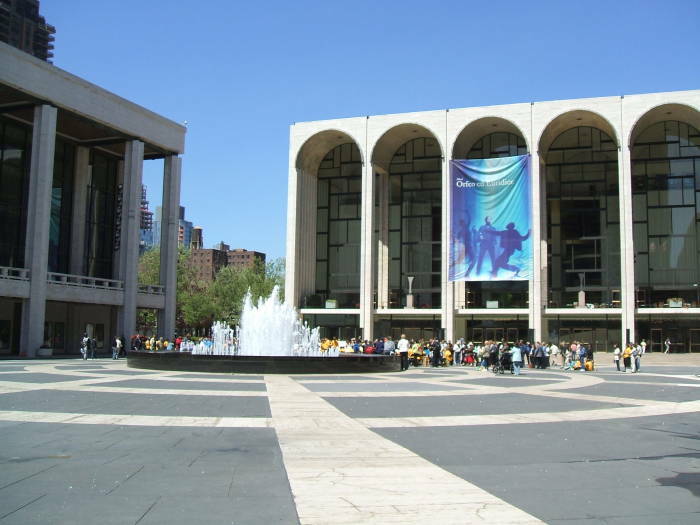 Lincoln Center is on Broadway at 62nd through 66th Streets. Take the #1 subway to its 66th Street station, shown here. Or, take any one of the #5, 7, and 104 buses running up and down Broadway, or the #7 and 11 running down Columbus Avenue, or the #66 cross-town bus. This New York MTA subway entrance is for the #1 train running up Broadway at 66th Street. This is the 66th Street — Lincoln Center Station. Lincoln Center is across Broadway to your left in this view. 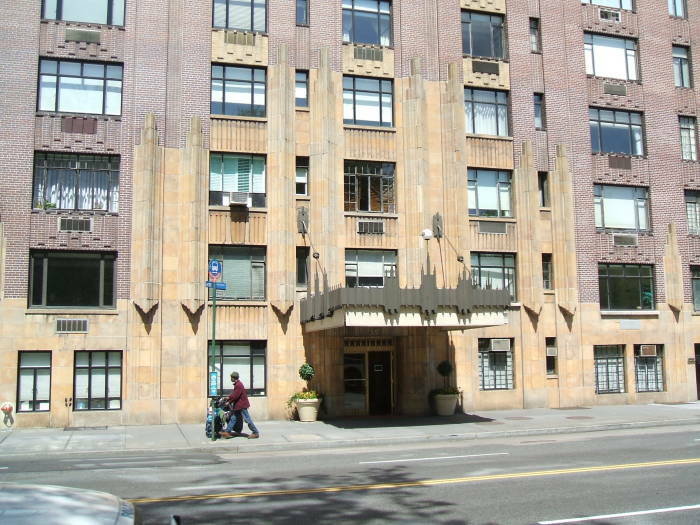 55 Central Park West is the site of the apartments of Dana Barrett and Louis Tully. Holy Trinity Lutheran Church, on its south side, has been fully restored since its damage by Gozer the Destroyer. Gozer is a Sumerian god worshipped by cults that arose around 6000 BC, banished into another dimension by the Babylonian god Tiamat. These are on Central Park West between 65th and 66th Streets. Simply walk one block east from Lincoln Center. Or, the #10 and 20 buses pass by on CPW. 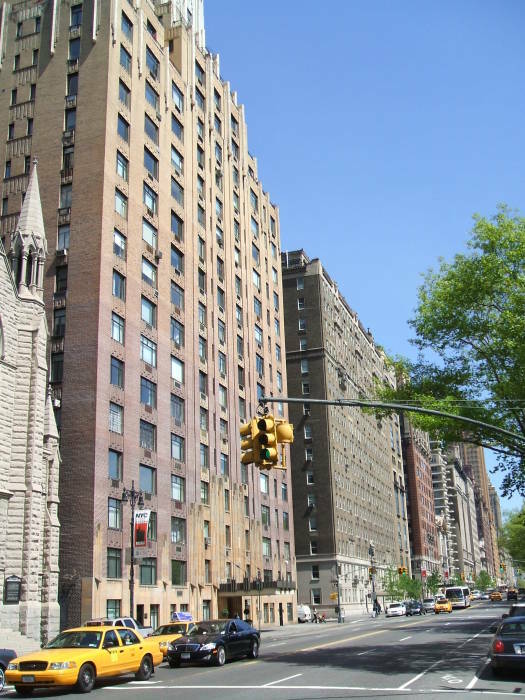 Here we are looking north up CPW past 55 Central Park West and the apartments of Dana Barrett and Louis Tully. The entrance to 55 CPW is seen below. Ivo Shandor, the insane physician who became an architect of some renown, became convinced by the aftermath of the first World War that humanity was beyond saving. He established a cult of almost a thousand Gozer worshippers in the 1920s. 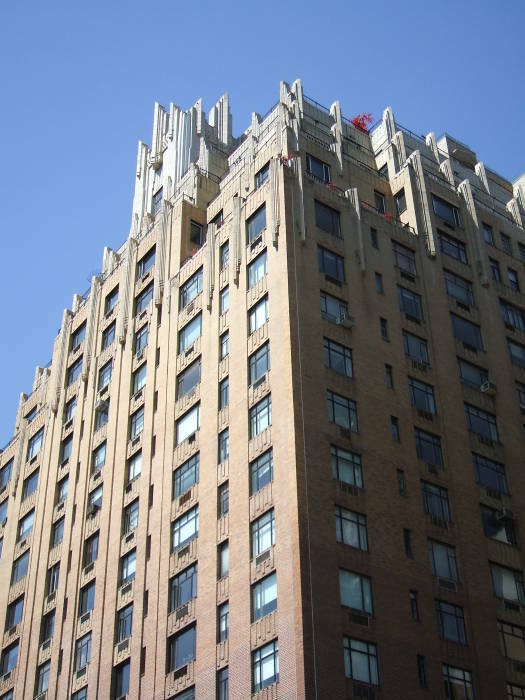 He designed and financed the construction of 55 Central Park West, including the magnesium-tungsten alloy used in its construction. The structure of the upper floors of the building was designed to open a portal through which Gozer could be summoned. 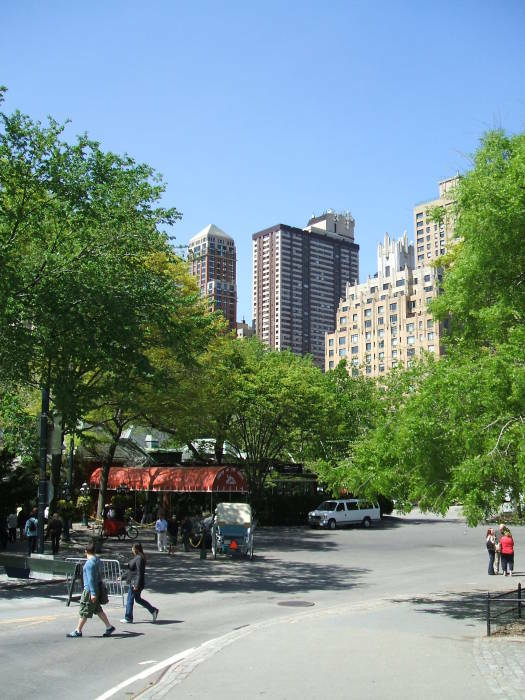 Tavern on the Green is in Central Park, just across Central Park West from Dana and Lewis' apartments. 55 CPW is visible in the second picture above, toward the right above the trees. Here you can see the greenhouse-like dining area of Tavern on the Green. It operated as a restaurant from 1934 to 2009 under a series of owners. Despite gross revenues of $38 million and over 500,000 patrons in 2007, it closed in 2009. The restaurant had agreed to pay $2.2 million to settle a lawsuit over claims of "pervasive harrassment" of women and minority employees. 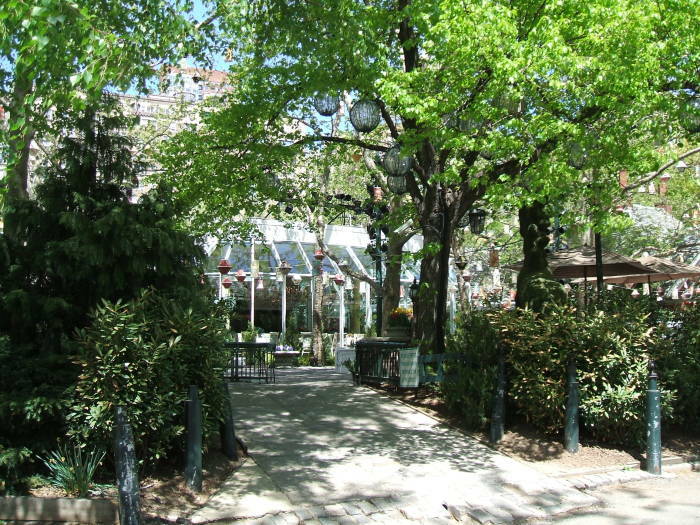 In 2009, the New York City Department of Parks and Recreation announced that it would not renew the restaurant's lease, and the management filed for bankruptcy the following month. Since 2010 it has been a visitors' center and gift shop run by the Department of Parks and Recreation. The glass-enclosed Crystal Room, seen through the trees here, was removed to expose the original 19th century architecture. It was originally built in 1870 as a sheepfold, housing the livestock that grazed in Sheep Meadow in Central Park. One of the best ways to see Central Park is by bike. Visiting the park is often one of the greatest highlights of any NYC trip. There are plenty of Central Park bike tours and rentals available to visitors. "Ghostbusters" must be the most Lovecraftian movie ever made. So, see where H.P. Lovecraft lived in New York and the museum of the artist who inspired him. Or, if you're looking for New York settings for movies and television series, check out the Fictional Architecture of New York.